(March 28, 2007) - When you look at golf course architect Rick Jacobson's resume, one name leaps off the page - Jack Nicklaus. But while Jacobson's history as a design associate with Nicklaus' firm is the sizzle on his CV, the work he's done since he began Jacobson Golf Course Design Inc. more than 15 years ago is surely the steak. At 49, with 25 years in the golf architecture game behind him, Jacobson is busier than ever, with seven projects ongoing, including the Lions Golf Resort in Guang Dong, China, and a collaboration with Nicklaus on Harbor Station in Prince William County, Va.
Add to that his extensive renovation work and it's easy to see why the national Association of Private Clubs & Directors named Jacobson its Golf Course Architect of the Year for 2006. While Jacobson will gladly accept the accolades, he's the first to point out that, like a quarterback, he's reaping the credit for a whole team's efforts. "It's always great to be recognized by your peers," he said. "The thing is, there are a lot of professions involved that make these projects come to fruition. It's a collaborative effort." Jacobson began to envision a career in golf design at the University of Wisconsin, where he studied landscape architecture. "I loved being outdoors," he said. "And then there's the architectural process where you put something on paper, and then see golfers out there that enjoy it." After his 1980 graduation and a short stint with a landscape-architecture firm, Jacobson went to work at Chicago course design firm Packard Inc. He moved to Wadsworth Golf Construction Co. when the two firms partnered in a joint venture. Jacobson signed on with Jack Nicklaus Golf Services as an assistant designer in July 1985, shortly before the Golden Bear's last great hurrah as a player. After Nicklaus won the 1986 Masters, "things really took off," Jacobson said. Jacobson quickly climbed the ladder, becoming a design associate and working with Nicklaus on a variety of projects throughout the United States and Asia. In November 1991, he struck out on his own. His firm's credits include Augustine Golf Club in Stafford, Va., which made Golf Digest's 1996 list of best new upscale courses, and Bull Run Country Club in Haymarket, Va., which the magazine named that state's best new public course for 2000. In Jacobson re-teamed with Nicklaus to create Bayside Golf Club in Sussex, Del. 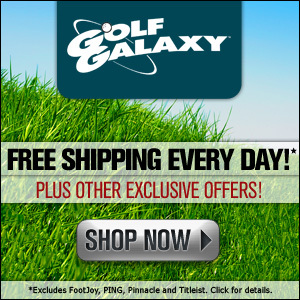 But while his old boss is known for his difficult courses, Jacobson has tried to stay player friendly. "I'm just an average golfer," he said. "It was a great experience to find out about shot values and some of the intricate things golfers of Nicklaus' level look for. But certainly one of the biggest things we strive for is playability, because I think designers have gotten away from it. We try and make our courses a fun experience." 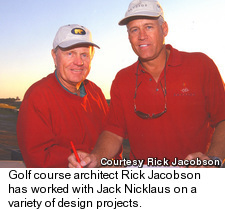 With his and the firm's record and reputation, Jacobson maintains a full plate of projects, but he always welcomes the chance to pair with Nicklaus, describing their Delaware reunion as a great experience. "I don't know what the future has in store for me," Jacobson said. "But working with Jack again was sort of like going full circle." Who should GolfCourseRealty.com profile next?